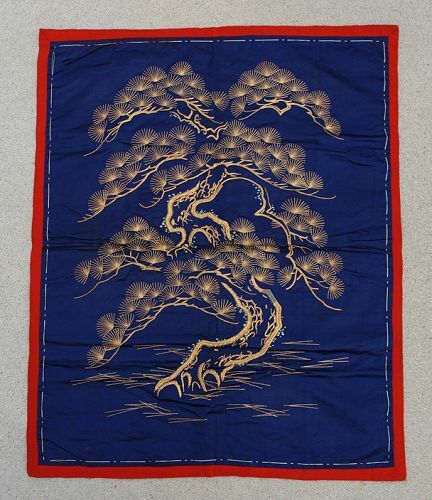 This is an old silk fukusa from Meiji period (1868-1912). This type of fukusa is a covering placed over a gift at the time of a gift-giving ceremony. It is almost in perfect condition lined with a deep red crepe silk. All the designs are done by gold couching, overlaying of threads (wrapped in gold) rather than going in and out of the base fabric. The color of gold is deep and shines well as you would find in other older fukusa in great quality. 25 5/8" x 32"